When I'm craving something sweet I prefer to eat healthy and homemade, as I'm sure you already know, rather than processed. A fruit dip made of wholesome Greek yogurt and Bob's Red Mill coconut sugar fits the bill. Coconut sugar is an all-natural alternative to refined sugar that imparts a slight caramel flavor into whatever it is mixed with. Believe it or not it doesn't taste like coconut at all. I've used it in baked goods and no-one was the wiser. Paired with your favorite fruit this healthy dip is easy to whip up at the spur- of-the-moment and will quickly satisfy your sweet craving. Mix together the yogurt and coconut sugar. Serve with fresh fruit for dipping. This sounds like a delicious snack! I love berries and yogurt. I know I'd love this, have you tried using coconut yogurt in it? I bet that would be fantastic, too! Such a great healthier snack option! I have yet to try cooking with coconut sugar but adding that to my grocery list! This dip sounds like a great dessert snack! This looks yummy! I haven't tried coconut sugar yet- but I keep meaning to!! I love greek yogurt dips! So tangy! I'm obsessed with Greek yogurt right now! I can't wait to try this out! I love the simplicity of this recipe. I have become a recent fan of coconut sugar. It tastes delicious in so many things and I use it as a substitute for sugar quite often. There are so many recipes now using coconut sugar! This looks like a great fruit or dessert dip. I always need something sweet at the end of the night but have been trying to cut back on all the sweets and sugars..this dip looks perfect for that! you got me at coconut...I am a fanatic for any kind of coconut product! I love yogurt. Love incorporating yogurt in whipped creams to make it a little healthy. Yogurt dip sounds amazing. My mom uses coconut sugar and I keep telling myself to pick up a bag. This sounds like a delicious dip for fruit! I'm always interested in a yogurt idea and this one is a keeper! 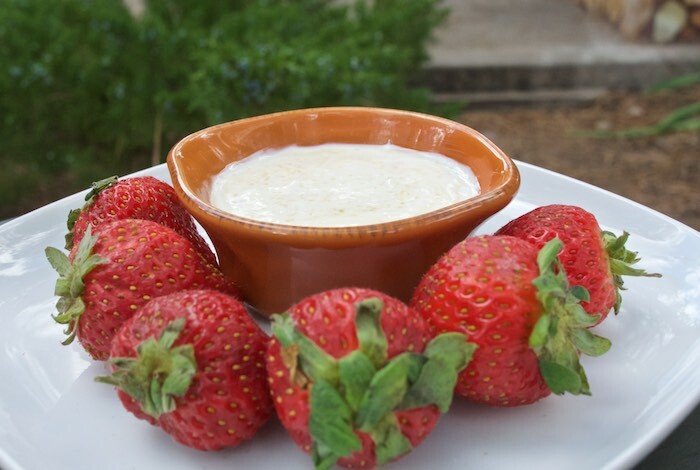 Nothing better than a quick and easy fruit dip! I would literally dip ALL THE FRUIT into this Coconut Sugar Fruit Dip! What a delicious and easy treat! What a delicious dip - I could imagine it with some cinnamon and nutmeg for some apples and pears too! Sounds equally healthy and delicious. Love it! Love this healthy snack option!